One of my many new years resolutions this year is to eat healthy and excercise more. Well, I think that's actually a resolution that I aim for every new year! :) But anyway, I really want to make it happen this year, especially since my cholesterol is a bit on the high side. Another of my favorite cooking divas is Claire Robinson. Her 5 Ingredient Fix episode last week focused on eating healthy and she made this Quickie Quinoa Salad. 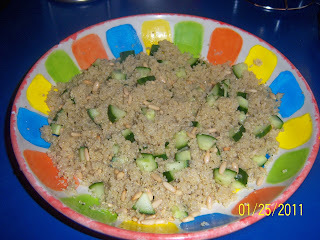 I've never had quinoa before, but I was up to giving it a try since this dish looked so good. For those who don't know, quinoa (pronounced keen-wa) is a complete protein grain that is said to be one of the best protein sources around! Quinoa contains no gluten, so it's perfect for those that follow a gluten-free/wheat-free diet. So I made this dish for lunch today and I was not disappointed! The taste and texture were both light and wonderful, and I have enough leftovers for a few more lunches. One note: I did not have lemon infused olive oil on hand so I used plain extra virgin olive oil. It still tasted fantastic! Below are a few pics, and the recipe follows. 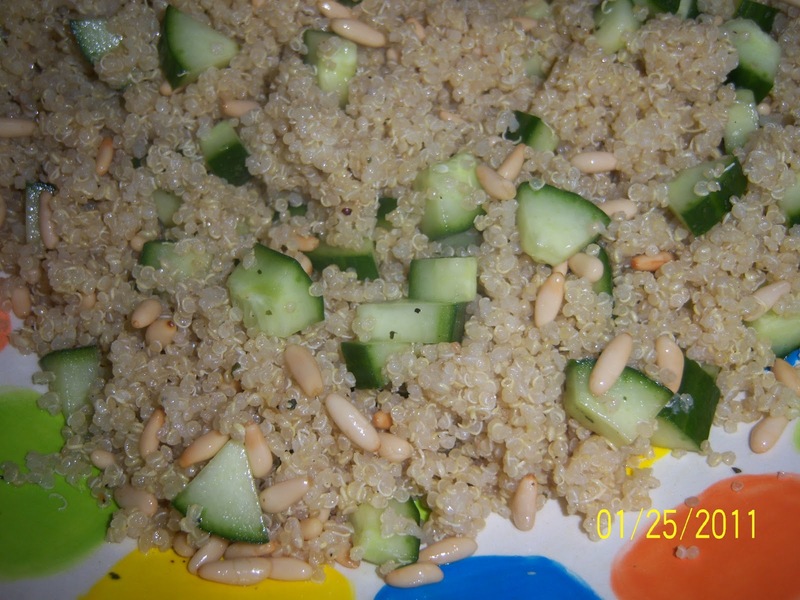 Soak the quinoa in water for 15 minutes, then drain. In a saucepan over medium heat, combine quinoa and 1 1/2 cups of water. Bring to a full boil. Cover the pot and let the quinoa cook for another minute. Turn the heat down to very low and cook for 15 minutes. Remove the pot from the heat and let sit for 5 minutes with the lid on. Uncover the quinoa and fluff gently with a fork. Set aside to cool. Meanwhile, put the chopped cucumber, cilantro, toasted pine nuts and the olive oil in a serving bowl. Season with salt and pepper to taste, then add the quinoa and toss. This looks interesting. I'm not sure if it's my cup of tea but cheers to you for trying new things! I live when healthy looks yummy!